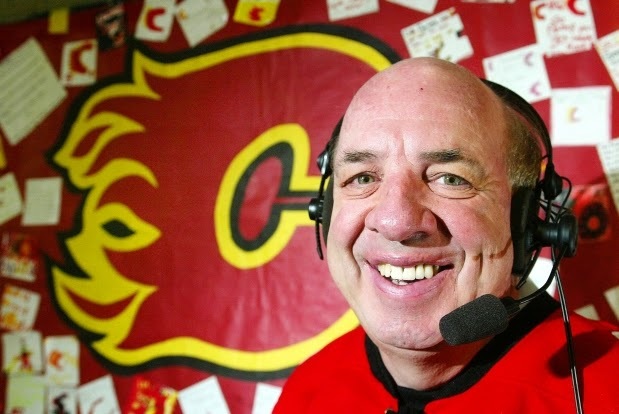 Peter Maher was the voice of the Calgary Flames for 34 years, ever since the Flames moved to Calgary from Atlanta. He was the voice that put us right down there at ice level with him, describing the ups and downs of the Calgary Flames for 34 years. I always remember his play by play of the Calgary Flames’ shocking and stunning upset of the heavily-favoured Edmonton Oilers in 1986. “He” was Peter Maher, and he announced his retirement earlier this week. My best friend Chris Vining and I were working for this greenhouse just outside Coaldale, and neither of us had a driver’s licence yet. We usually got picked up, but every so often we had to work late and got a ride home from one of the sons of our boss. One of the sons was an Oiler fan, one was a Flames’ fan. The Flames met the Oilers in that iconic, seven-game Smythe Division Final in 1986, the first spring we worked at the greenhouse. The series went back and forth. On one particular night, the series was tied when Marty gave us a ride home. He was the Calgary fan and said we had to listen to the game. My brother was a big Flames fan and loved the play by play of Peter Maher. Up until that point, I had never heard Maher call a game. This was the first and the best. Although his broadcast just served as a bridge from the TV in the greenhouse to the TV at home, it was awesome. The Flames were pressing. Suddenly, Hakan Loob scored and we were all yelling in the cab as we dropped Chris off first and then me. The Flames would go on to upset the Oilers and shock the world. We tuned in for the Campbell Conference Final against St. Louis and that game where the Flames blew the three-goal lead and lost in overtime. It was Maher describing the game as it began to unravel for Calgary. Maher was also there to tell us all about the Stanley Cup Final and Calgary finding absolutely no answers for the Montreal Canadiens en route to a loss in five games. Peter Maher did not cross my mind again until the Flames put together that magical run in 2004. I was surprised he was still calling the games. Most of his contemporaries had already retired by then. I would tune in during the playoffs every time I was travelling, hearing Maher describe how the Flames took out first Vancouver, then Detroit, and finally San Jose to reach the Stanley Cup Final, before losing in seven games to the Tampa Bay Lightning. Two years later, Maher was inducted into the Hockey Hall of Fame, a richly deserved honour. That was the last time I heard him speak. A couple days ago (April 29), Peter Maher announced his retirement. He wants to spend more time with his family, lamenting all the moments he already missed because he was working. He vowed to be there from now on. Who can blame him, because he devoted the past 34 years of his life to bringing the Calgary Flames into all our living rooms, kitchens, cars, trucks, and over the past decade or so, our computers and iPhones. He was there from the moment the Flames moved to Calgary from Atlanta, and will go down in history as one of the best ever. He was there for all three of Calgary’s trips to the Stanley Cup Final, in 1986, 1989, and 2004, and he broadcast the 2010 Vancouver Winter Olympics. Moreover, he went out while he was still on top, and not everyone can say that. His retirement severed likely the last tie the Flames had with 80s, but time inevitably marches on, doesn’t it? Enjoy your retirement Peter Maher, you have certainly earned it.